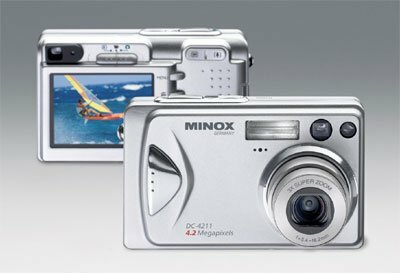 The MINOX DC 4211 is another milestone in the segment of small and flat digital cameras: 4.2 million pixels, 3x optical zoom as well as a large 2“ TFT color monitor in an elegant aluminium body make this powerful digital camera a prestigious item which perfectly combines function and design. The MINOX DC 4211 has a CCD image sensor with 4.2 megapixel and boasts the fast, high-performance MINOCTAR lens with multiple coating. The 3x zoom lens has an autofocus feature and gives the user freedom for creative picture composition. Thanks to the individual adjustment to the 4.2 megapixel sensor the MINOCTAR lens, together with the electronics and software of the MINOX DC 4211, provides highly dynamic images with natural colour rendition. The automatic white balance ensures the right exposure, even in difficult light, providing the user with natural colours and the correct setting for the subject in view, every time. The four flash functions enable the ideal adjustment of the shot to the outside conditions. A fast image sequence and minimal shutter release delay allow spontaneous snapshots whatever the situation. The large 2.0’’ TFT colour monitor simultaneously offers users the opportunity to conveniently assess the image straight away, during and after the shot, and provides excellent viewing, even in sunlight, thanks to its pin-sharp definition and brilliance. For an uncomplicated transfer of the image files to the computer the MINOX DC 4211 comes with a digital USB interface. Using the provided software the pictures can be touched up on the PC and mailed directly to others. Extremely compact dimensions of just 88.5 x 24 x 54.5 mm make this lightweight masterpiece the perfect companion for every occasion – always ready to capture any situation as it occurs. The scope of delivery includes a rechargeable Li-Ion battery, 32 MB SD Card, a case, wrist strap, USB cable, video cable, CD-ROM and user’s manual.